Habit: Cespitose. Stem: 2--8(10+) dm, glabrous to puberulent. Leaf: generally basal, tufted, glabrous to puberulent; ligule 1--2 mm; blade 2--20 cm, 1--2(3) mm wide, generally ridged. Inflorescence: 2--15 cm, 1--2 cm wide, cylindric to narrowly conic, or wider in full flower, interrupted at base. 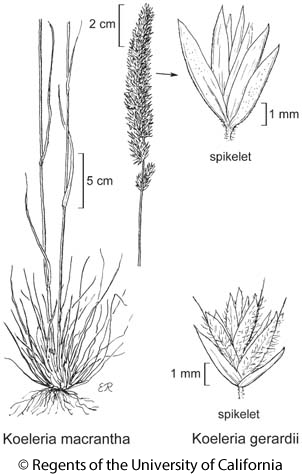 Spikelet: 4--6 mm, +- shiny, tan (occasionally +- purple); florets 2--4; lower glume +- 3 mm, upper +- 5 mm; lemma 3--5 mm, acute to small-pointed at tip. Chromosomes: 2n=14. Synonyms: Koeleria cristata Pers., superfl., in part; Koeleria cristata var. longifolia Burtt Davy; Koeleria gracilis Pers., illeg. ; Koeleria nitida Nutt. ; Koeleria pyramidata (Lam.) P. Beauv., misappl. Citation for this treatment: Dieter H. Wilken 2012, Koeleria macrantha, in Jepson Flora Project (eds.) Jepson eFlora, http://ucjeps.berkeley.edu/eflora/eflora_display.php?tid=29951, accessed on April 23, 2019. NW, CaR, SN, ScV (Sutter Buttes), CW, TR, PR, GB, DMtns; Markers link to CCH specimen records. Yellow markers indicate records that may provide evidence for eFlora range revision or may have georeferencing or identification issues. Purple markers indicate specimens collected from a garden, greenhouse, or other non-wild location.